Outdoor telecom cabinets contain a range of equipment that needs to be monitored and protected against theft and damage. AKCP manufactures a complete range of hardware and software monitoring products designed specifically for equipment found in remote telecom or electrical cabinets. Environmental and equipment parameters are monitored 24/7. Alerts will be generated when sensors go outside of pre-defined limits. AKCP Sensor Controlled Relays allow you to save time, eliminate site visits and save money. Many equipment problems can be resolved with a simple reboot. AKCP’s software and hardware relays are perfect for remotely rebooting servers, kiosks, ATMs, digital signage, workstations, servers and any other machines on a distributed network. Monitor devices using PING or more sophisitcated command response scripts sent from the central server. If the remote equipment responds incorrectly, an encrypted , password protected software shutdown command can be issued. If the system fails to response automatically power cycle equipment that has locked up. Create scheduled reboot actions to refresh devices. AKCP provides low cost dry contacts that can be configured as inputs or outputs. They can detect many inputs such as UPS statuses, security systems, alarm panels or air conditioning statuses. From sounding audible siren alarms, manual switch on and off relays or even control a cooling system. AKCP give you the flexibility to monitor and respond to physical alert conditions from any location. 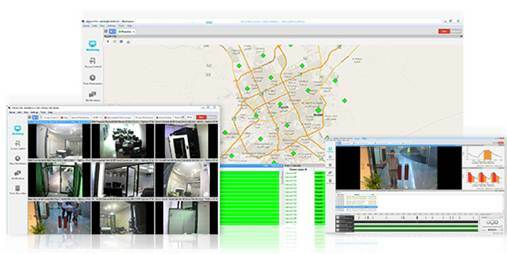 The backbone of AKCP’s remote cabinet monitoring system is the AKCess Pro Server. Installed at a central location, the AKCess Pro Server enables administration and control over your entire remote cabinet infrastructure. * Price shown reflects a quantity 1 and includes the OCU2, RFID Reader and Electronic Bolt Lock.